I'm determined to keep on bloggin' and I'm going way out of my usual territory to comment on some people I just can't stop thinking about. Or more specifically, listening to. And this is very different for me because I don't listen to much new music at all! I chanced upon watching this group of youngsters playing covers of some really rocking songs, and they just floored me! 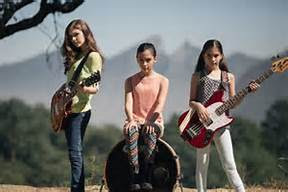 The group is called The Warning, and they are a trio of sisters from Mexico who can absolutely rock. Daniela, Paulina, and Alejandra are performing songs I could never imagine a "girl group" could pull off, much less a group whose eldest member is 15 years old (or maybe 16 by now--but something like that)! I play a little guitar (and no, I don't mean a ukulele), and I wish I had a quarter of the talent these girls have. They really know their stuff! They plat most songs as a power trio (guitar, bass, drums) though from what I've seen and read they can also play some piano and saxophone. The girls have even recorded some really cool original songs. I have a problem picking out my favorite. Right now I'd go with "Free Falling" as my favorite original song and "Resistance" as my favorite cover. I don't know what else to say but I hope everyone reading this can check them out and give it a listen...I think you'll be impressed! It's about time I catch up on Out With Dad! I'm really trying to blog more about this and other things. other things have been more on my mind lately, plus I haven't been very good at keeping these postings weekly, but here goes some commentary! The last episode I commented on introduced Owen. A lot has happened since then! Episode 4.05 is called "S'Mores with Dad" and features a campfire, a flashback, and a great conversation between Rose and Nathan. 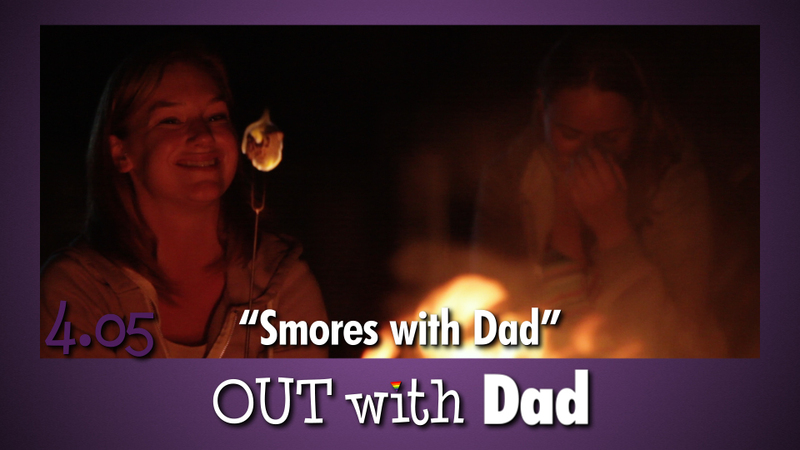 Most importantly, this episode discusses the correct way to roast marshmallows. Nathan totally has it right. What's the point of blackened sugar? Marshmallows should be nice and brown, a little crispy on the outside and gooey on the inside. At least that's how I used to do it. I hated them black. But eventually I realized I don't really care for marshmallows at all. Except when holding together cereal treats, of course! Then the conversation turns to Vanessa. Rose hasn't talked about Vanessa to anyone for three years apparently. But she wants to now (which is nice for us viewers). She talks of the great times she spent with Vanessa when she liked but didn't like-like her. The innocent times of youth and ignorance. Rose notes that her coming out was what destroyed her and Vanessa's perfect relationship. We also find out Rose wrote an article when she was 16 that told of her school's refusal to allow a GSA. The article was published in a national newspaper. Nathan's words to his daughter caution her of looking back too fondly on the past. Remembering the good times is okay, but we have to press on and there's a lot of good things ahead. Rose became a productive member of a community and helped bring about social change. Is this more important than keeping a best friend? 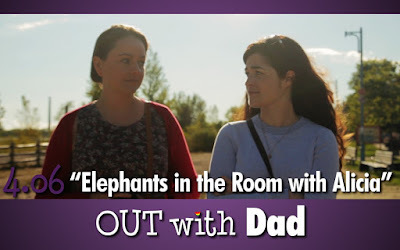 Episdoe 4.06 is called "Elephants in the room with Alicia" and starts with the sweetest little cameo by Claire, which really expresses the real-life situation of having the money and time to bring Caitlynne Medrek back for an appearance on season 4. But the main thrust of the episode is Rose and Alicia discussing their past loves. Starting with Kenny, who has unfortunately become a pot-head loser since High School. Which really upsets me, as he was my favorite character. Though he was a slacker, I always figured he'd have some niche to make his life have meaning. At least it's hard to feel sorry for Alicia for not being with him anymore. Concerning Claire, they talk about how no one was to blame, and it was bad timing. We also find out Claire has a girlfriend. Yay! Good for her! And that's about all that's new, but there is a sense of anticipation that maybe...Rose and Claire can have a reunion of sorts some day. And I know I've gone on and on in the past about how much I like Kate Conway, but did I mention lately that Laura Jabalee is just adorable? Well, now I did! Okay, that's two episodes down and...I need to get busy!! Terry Brooks is my all-time favorite writer, and the Elfstones of Shannara is my all-time favorite book. I'd go as far to say that it is the best book ever written, and the book that cemented me as a life-long Brooks fan. There have been several times in the past when the rights to turn the story into a movie have been bought, but nothing ever came from such projects. Until now. MTV has debuted The Shannara Chronicles, which is currently airing every Tuesday and will consist of 10 episodes, adapting the Elfstones and, hopefully, setting up further seasons adapting other books. So, now I can review the first 2 episodes and give my thoughts about the show. First, the good: The visuals are stunning! They have gone to a great length giving this world a unique fantasy feel. 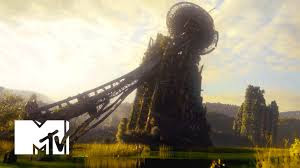 It has a great mix of classic fantasy and post-apocalyptic background. This really expresses the magic of Brook's world, and separates it from other fantasy stories. Also, the acting is super! The characters really come to life, at least so far. The actors have the look and feel of the book characters, as far as I'm concerned. With the exception of Amberle not having the bright red hair I picture her with. Finally, the show is full of action and suspense. The villains are deadly and scary and there is danger around every corner! You get the feel that the good guys don't have a chance! Now the bad: Apparently the original story is too full of drama and characterization, so the writers of the TV series decided to change it. The plot is totally different, with the plot and settings changed a lot. It's still a good, dramatic story. But it isn't (so far) as exciting or interesting as the book. It begs the question: when you're working with the greatest book ever written, why would you change so much? It seems to me it would be smarter to change as little as possible. Apparently, Brooks is okay with the changes. But still, to me this is allowing inferior writers to mess with perfection. Bah! I say! Oh, well. I'm still enjoying things. Just not as much as I could. 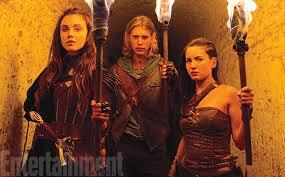 Hopefully this show encourages a new generation to pick up some Shannara books, so they can see why they are so great! I've made a decision. I have, reluctantly, decided to post my Mutant Elf webcomic on a bi-weekly schedule. Mutant Elf has been weekly since it began, never missing a deadline. (After all, it's only one page a week...not so hard.) I'm not changing it to bi-weekly because I've slowed down on my output, though. I'm changing it so I have time to work on my new project. The new project will also be bi-weekly, being posted on the Sundays that Mutant Elf is not posted. So it's the same number of comics, just spread over two series. It's a new year, and awesome stuff is coming, I'm sure. So I'm trying to do my part and be as awesome as I can! Please check out the new strip every other Sunday!